The 65UK6200 is crafted with a slim, seamless body that’s ideal for any room aesthetic. Queue up movies, TV shows, online content and more from top content providers then toggle between them with an impressively intuitive interface. Paired with the LG Magic Remote, seeing all your favorites is as easy as the flick of the wrist and the press of a button. The UK6200 uses a powerful quad-core processor that minimizes video noise, enhances sharpness and assures accurate colors for a remarkably lifelike 4K picture. 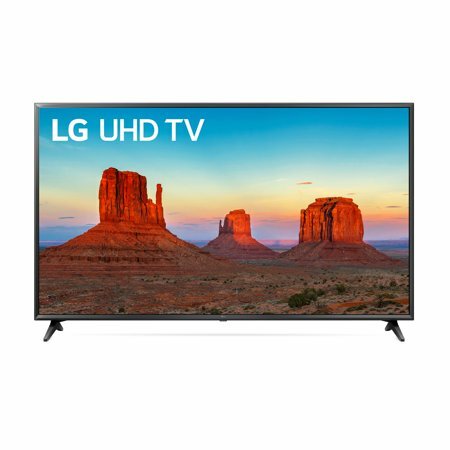 This LG 4K TV supports multiple formats of HDR content, including HDR10 and HLG, both optimized with scene-by-scene picture adjustment. Ultra Surround Surround yourself with heart-pounding audio inspired by today’s sophisticated movie soundtracks. Ultra Surround delivers an immersive audio experience from seven virtual channels, requiring only the built-in speakers of the TV. 4K Active HDR This LG 4K TV supports premium content choices, all optimized with scene-by-scene picture adjustment. The multi-format 4K high dynamic range support includes HDR10 and HLG, both with LG’s advanced tone mapping technology that provides scene-by-scene optimization. had my first one almost 3 months before I had vertical lines on the screen, returned it to the store and got a new one. Our tv is on 20 hours a day on average and don't have any trouble with it. the only reason I give it 4 stars instead of 5 is because it doesn't have Roku. the picture is great, the sound quality is fabulous. was simple to plug my Bose system into it.